Reduce food waste using Bokashi Composting. Create awareness and share important information about our current food cycles. Provide simple, affordable and sustainable ways to stop wasting food. We are organizing for upcoming events, adding photo's of our recent projects and soon we'll be offering new packaging. Our Bokashi bran is still hand made with high quality ingredients in Monmouth County New Jersey. We appreciate your business and loyalty. Give us feedback or Any kind communications. ​Thanks for visiting our site. Composting is EASY with Bokashi. Using a fermentation process with a bucket, bran and food scraps you can easily divert your organics out of the landfill and create healthy soil that grows stronger plants. Whether you live in a house, condo or apartment you can compost with the Bokashi method. RESIDENTIAL PICK UP: On a fuel efficient route, we bring you a bucket, an air-tight lid and Bokashi bran. You layer organics and bran to fill the bucket then we come pick it up and drop off a clean one! We bring the organics to a local farm where it's turned into healthy compost rich soil. In return you get screened clean compost or top soil back in the Spring. COMMERCIAL PICK UP: Contact us for a quote for your restaurant, school or small business. Bokashi Soil - See the Results! Bokashi is a Japanese term meaning "fermented organic matter". In this context we are using the anaerobic fermentation process to compost food scraps. Bokashi expedites the composting process and adds effective microorganisms to the soil that aid as a pro biotic. See the results of Bokashi Composting today! 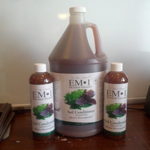 EM•1® contains effective microorganisms that break down organic and inorganic compounds. Used as a soil conditioner, it helps create the optimum environment for your plants to grow. Used for bio-remediation it can clean up mold, chemical spills and eliminate persistent strong odors, such as those from pets and garbage. You're right. Once I followed your directions, this is much easier, no smelly -"yuck" factor for hubby and kids, and I can't wait to start my garden this year! All the compost is much more usable much sooner than my old method w/o the bran. Thanks! I have a few inside/outside cats and in the winter they're less inclined to go outside. Debbie Lee told me about using GQ Bokashi bran as a kitty litter deodorizer and it works great! No ammonia smell in the house at all. I've been using GQ Bokashi bran, GQ 5 gallon buckets and the Earth Machine since the Spring of 2015 and it's by far the simplest way for me to manage my food waste. Thanks for all your help. Thanks to GQ, my granddaughter and I can easily manage our food waste. I live in an apartment with a small yard and a I can only container garden. Using Bokashi composting there is no smell or fruit flies and I can put the food scraps right into the soil or one of my large pots. I'm pretty busy working and babysitting so I like how easy it is.